Are you watching the new Marie Kondo show on Netflix? Or have you read The Life Changing Magic of Tidying Up? 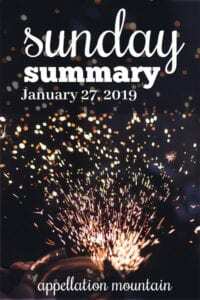 The Japanese lifestyle consultant urges us to discard anything in our lives that doesn’t spark joy. You can imagine the jokes, the memes about getting rid of the washing machine and the bathroom scale. But is there anything to the idea? When it comes to naming, should we reject any potential name that doesn’t give us a little thrill? I’m not convinced the answer is yes. It took me years – no, really, years – to fall in love with my firstborn’s name. But I didn’t exactly doubt the decision. We used a family name from my husband’s side, one that meant a tremendous amount to him. Today, seeing my teenage son tower over his namesake grandfather? It sparks joy now, even though it didn’t necessarily, all those years ago. Then again, I do believe we should use the names we love. It’s just that love isn’t always a straightforward emotion. After all, I gave my son his name out of a deep and lasting love, a commitment to family that was bigger than my own wishes. How could I regret that? Of course, that’s easier said than done! Another Kondo-inspired Q: will Marie catch on? I say it’s one of the most overlooked names out there. It was routinely stuffed in the middle spot, a filler name for a generation of women. But today, it’s what so many parents seek – a classic name that’s seldom heard, but instantly familiar. The tremendous appeal of Marie Kondo might push it up the popularity charts – and inspire a generation of children who neatly fold their onesies. Did you catch the Fiji water girl at the Golden Globes earlier this month? The model kept popping up in the frame during interviews with nominees and glitterati on the red carpet. Turns out her name? Kelleth. And she’s landed a gig as a Super Bowl correspondent. And a soap opera role. I can’t find much on the name – presumably it’s a twist on Kelly? Speaking of twists, there’s a new baby giraffe at the Albuquerque zoo, and he’s named Neelix, after a Star Trek: Voyager character. I suppose there’s a passing resemblance – the alien had a sort of spotted complexion and a tuft of hair, too. But I’m wondering – does Neelix work for a child? With familiar Neil and vintage Felix, Neelix might not be the most outlandish suggestion ever. Two Billys and a Ralph in the latest British Baby Names birth announcements – plus a girl name Elspeth Evelyn. These posts are always a highlight of my week. Some rock solid advice here. 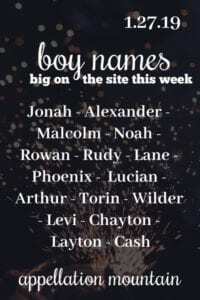 I think I really like every one of the boy names on this list. Every single thing Duana said here. 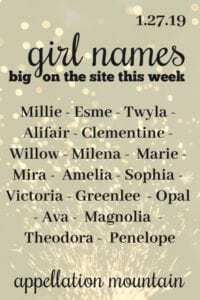 A good list of fits-in/stands-out names for girls. Newsflash: that whole thing about babies being named for Instagram filters? It wasn’t a thing. My two year old is named Marie! We were prepared for comments that her name is “old-fashioned”, but that hasn’t really happened. We were not prepared for the number of complete strangers who are completely delighted by her name! We have been told so many times of beloved grandmothers, mothers and aunts who share our daughter’s name and the memories that have been kindled by hearing it on a little girl. So while I hope Marie doesn’t become *too* big, I can assure anyone considering it as a first name that any fears of negative reactions are probably unfounded. When we named our daughter, it was a name I’d always disliked. However, I super liked the nn, and my husband was the one who argued for the full form, and while I didn’t like the name, I loved the idea of HIM (i.e., the NON-onomast in the family) picking our daughter’s name — it seemed even more special. Now, I can’t imagine her being named anything also; though strangely, G takes umbrage to being reminded that her name is the full form, rather than the short form, which she prefers! As a hockey fan, you might be interested to know that the goalie for Montreal, Carey Price, and his wife welcomed a daughter named Millie over the holidays. 🙂 Big sister is Liv. Have you read any of the info out there about how we’re all pronouncing Marie Kondo’s first name wrong? You can hear her pronouncing it this way on the show too. I know she has a team of people and if the pronunciations were a big deal to her, it likely would be addressed, but I’m fascinated by the whole thing. I’m curious especially about who/what decided to spell it Marie in the Latin alphabet, if it should be pronounced Mah-ri-eh. NO! I haven’t. And I haven’t really watched the show – just glanced at a few episodes. So now I need to go back and pay attention. I wondered about the pronounciation too, especially how she calls her philosophy the “KonMari” method. When I read the book, I imagined it pronounced like I would pronounce Marie, ie. Kon-MaRIE. But then I heard it on the show as Kon-MARry. It made me wonder why she decided to split up the vowels that way, it probably makes sense in Japanese.